Jammu & Kashmir is the northernmost state in India. Large parts of it have, however, been annexed by China and Pakistan. Yet, some of the most majestic parts of this state remain in India. In recent years, a section of the people in the state have risen in revolt against the Indian government. The result is an undeclared civil war in one part of the state. This part is the Kashmir Valley. The other two main parts of the state - the Jammu and the Ladakh regions - continue to oppose the revolt in the Valley. 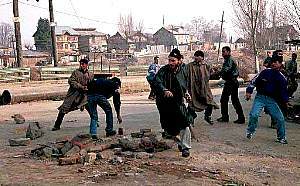 Unrest has been witnessed in the Pakistani annexed part of Kashmir as well. Pakistan does not offer the people of the annexed areas any political rights and has put down revolt by brute force. The people in the Kashmir Valley in India have political rights but many of them believe they are different because of their history and religion. The result of all this is conflict, distress and endemic violence. Much of this violence is the result of the proselytising efforts over the decades by the puritanical Jamaat e Islami religious organisation. Muslim youth in the have been taught to believe that their religion does not allow them to live with people of other religions and that is why they must fight for accession to Pakistan. This has almost destroyed the traditional spirit of Kashmiriyat. More than a quarter million Hindu inhabitants of the Valley have been forced to flee to the Jammu region. The Jamaatis and their supporters, including fringe political organisations, have consistently been attacking secular institutions, parties and individuals for more than 2 decades now. The Jamaatis and their like, which includes organisations like the All Party Hurriyat Conference (APHC), pretend to speak for all of Jammu & Kashmir but their movement remains largely restricted to the 30 miles by 60 miles Kashmir Valley in the state. Most violence outside this area, like in the mountains of Doda, is carried out by death squads, mostly non-Kashmiri in origin. They also never speak against the injustices suffered by citizens in the Pakistani annexed part. In short, the current movement launched by the Jamaati clan (initially against the National Conference) against the secularists and ostensibly against the Indian government is directed towards the destruction of the unity of the state. The movement has already beggared thousands of Kashmiris, turned a beautiful place into a war zone and given power to thousands of religious fanatics. All Kashmiris do not agree with the Jamaat view and continue to oppose them. These Kashmiri brothers have been slaughtered by the Jamaatis and their Pakistani agents. With the Indian security forces they can say it is a battle - a civil war - but how can it be a war against their own brothers? Two sides fighting a war are justified in killing each other brutally. But this cannot be within a family even if there are differences of opinion. Violence is endemic in some parts of the state. But on the whole J&K is a perfectly safe place for tourists. It is these sad realities that form the psychological backdrop of the state of Jammu & Kashmir. For the casual visitor to the state, however, the reality is somewhat different because it is distilled from what the tourist sees and hears. The worst experience awaits those who fly to Srinagar. The first reality that hits even the most hardened of tourists is the overwhelming and intrusive security. The security checks start from the airports. There are policemen and soldiers all over the place. The urban educated youth in the towns of Srinagar and Anantnag generally despise the security forces and stone throwing incidents are often visible. The security forces personnel tend to view all local inhabitants as potential terrorists and treat them badly. This causes great resentment amongst the locals who feel increasingly alienated from the government. Terrorists add to the problem. Bombs and other explosives are planted secretly by them - often in the busiest places. This kills not just security forces people but locals as well. Many of the terrorists are from Pakistan and they do not care if local Kashmiris die. Flights from Delhi and Amritsar link to all the three main regions of the state - the Kashmir Valley, Ladakh and the Jammu region. All the major airlines including Air India, Jet Airways, Indigo, SpiceJet and others fly to the state. Check with their websites for schedules and tariffs to Srinagar, Leh or Jammu. The local people are very friendly towards tourists and are sad that fewer tourists are coming ever since the movement started. Houseboat owners, restauranteurs and shop keepers who depended on the inflow of tourists every summer have been badly hit. Many of them have left the Valley and migrated to Jammu, Delhi or even as far away as Bombay. Today, sellers of Kashmiri carpets, furniture and other handicraft can be found all over India. 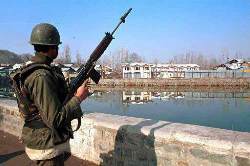 People in other parts of the state have also been affected by the violence in the Kashmir Valley. The economy of the state as a whole has witnessed a decline and the all pervading atmosphere of terror and killings have cast a pall of gloom over the entire state. Yet there is much to see in the state, which is large and diverse. The largest part of the state comprises the Ladakh region, which is separated from the rest of the state by the formidable Zanskar range. Much of Ladakh is above the tree line. The landscape here is surreal and wonderful. Many say Ladakh is moonscape. The people here are Buddhists and have a very different way of life. 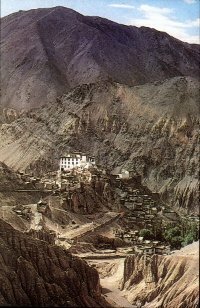 In the northern parts of Ladakh - in the Kargil region - the inhabitants are Shia Muslims. These people do not support the violence in the Valley and are afraid of being dominated by the Muslims of the Kashmir Valley. It is therefore a very different world in this part of the state and many foreigners too do not realise that Ladakh is part of the state of Jammu & Kashmir. The people of Jammu too are very different. They speak different languages like Dogri and Poonchi. The terrorists operate here to create a wedge between the local Muslims and Hindus. Terrorists have massacred Hindu villagers here by the hundreds while leaving Muslims alone. This kind of selected communal killings has even been condemned by Muslims. In other words, the tapestry of this state is complex and not just a simple political issue. Before embarking on a journey to J&K, it would be well worth it to spend some time reading about the state and its diversity. In the next few pages we try to describe in very simple terms the differences in the different parts of the state. These facts and figures could be useful for researchers as well.